Sunday-morning learning classes for all ages are offered 10:20-11:05 a.m., September through May. This age group gathers on the lower level of the education wing, in the area called Faith Trek. 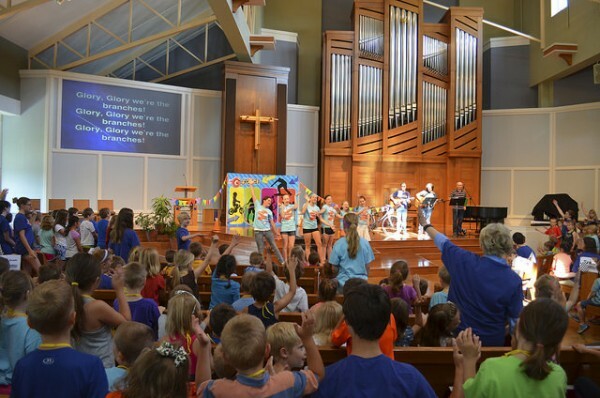 God’s Word provides the compass for this journey of faith – where kids can stretch out in the twinkling Star Theatre with popcorn and movies, or take an artistic plunge in the underwater world of the Seaside Studio. Newcomers are welcome to join in classroom learning at any time. Stop at the Information Center to help find your way to a classroom. Spark is our engaging curriculum for children. Each week, kids open their Bibles and encounter God’s Word. They explore faith through interactive activities and games, colorful lesson leaflets, creative art projects, and engaging music. Third grade | God’s Word Milestone: Children and parents learn together about God’s written Word. Each child receives a Bible suited to a third-grade reading level, along with a blessing from the congregation. Fourth grade | Holy Communion Milestone: Children and parents learn about the sacrament of Holy Communion. During the five-session Sunday-morning unit, each child creates a clay chalice. Held in the spring, children receiving their first communion during the Maundy Thursday evening service.